The 2014 First-Year Player Draft dominated all minor league news last week, and why not? The three-day event seems to draw more and more interest every season. We had you covered here at SoxProspects.com with everything you needed to know. For a full summary of how the Red Sox's draft shook out, check out the Day 1 recap on ESPNBoston by SoxProspects.com's Editor-in-Chief Mike Andrews, and Day 2 and Day 3 recaps by Matt Huegel. Also, read Harry Burnham's story on how the picks stack up to pre-draft rankings. With their first pick and the 26th overall selection in the draft the Red Sox took high school shortstop Michael Chavis (Pictured), an 18-year-old from Marietta, Ga. Chavis was considered one of the best high school bats in the draft, writes SoxProspects.com's Jim Crowell in his analysis of the pick. Chavis told NESN.com's Ricky Doyle that he was "absolutely thrilled" to be selected by the Sox. The comparisons of the 5-foot-10 Chavis to current Red Sox second baseman have already begun, and Doyle writes that Chavis has already modeled his game after Dustin Pedroia. Michael Silverman of the Boston Globe noted that Chavis is a "do-it-all player" in his draft analysis. With their next pick, the 33rd overall selection, the Red Sox selected Michael Kopech, a right-handed high school pitcher from Texas. Kopech dominated at Mt. Pleasant High School, allowing only four earned runs in 64 appearances, writes SoxProspects.com's James Dunne in his analysis of the pick. With their final pick on the first day, the 67th overall selection, the Red Sox took Sam Travis, a first baseman out of the University of Indiana. Travis had an extremely successful college career, including winning the Most Outstanding Player award at the Big Ten Tournament and the NCAA Regionals in 2013. Tim Britton of The Providence Journal noted the Chavis and Travis picks as attempts by the Red Sox to stockpile right-handed power potential, which he said is becoming one of the rarer traits in the sport. In the third round the Sox took right-handed pitcher Jake Cosart, the younger brother of Houston starter Jarred Cosart. Cosart, 20, came out of junior college in Florida and has been clocked as high as 98 miles per hour on the radar gun, SoxProspects.com Jim Crowell writes in his analysis. Britton writes that Cosart has a model to follow in his older brother. Had enough of the draft yet? If not, check out the SoxProspects.com podcast recapping the draft. The end of the draft also marks the beginning of the signing period. Don't worry, we've got you covered for that as well. 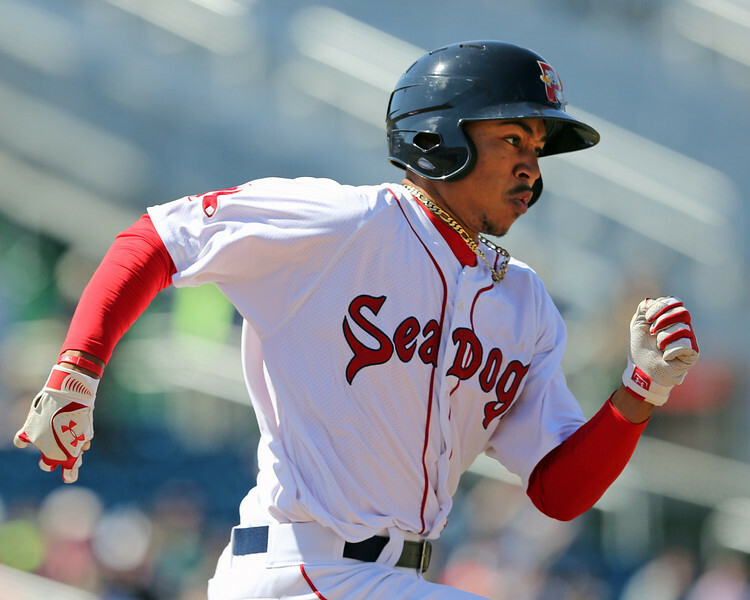 On June 3, top prospect Mookie Betts (Pictured) was promoted to Triple-A Pawtucket. The second baseman and center fielder tore up Double-A, producing a .355/.443/.551 line across 253 plate appearances. The 21-year-old made his presence known early into his promotion by slugging an 11th inning game-winning home run in only his second game. As of Monday, Betts is 7 for 24, good enough for a .292 average, and has five walks. Three members of the Salem Red Sox, pitcher Justin Haley, second baseman Reed Gragani, and utility man Jonathan Roof, were named to the Carolina squad for the Carolina/California League All Star game set for July 17. Greenville will send six representatives to the 55th Annual South Atlantic League All-Star Game. The group is headlined by players&nbspCarlos Asuaje, Jantzen Witte, Joe Gunkel, and Jake Romanski. Drive manager Darren Fenster and pitching coach Paul Abbott will serve as coaches for the All-Star squad. Photo Credit: Michael Chavis from Collegebaseballcentral.com and Mookie Betts by Kelly O'Connor.